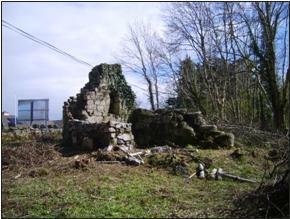 This spring, a magnificent clearance has been undertaken, (together with the enthusiastic landowner, Pat O’Halloran) to remove overgrown trees, briars, ivy and rubbish to reveal once again the ancient church of St Brecan in Rosscahill. 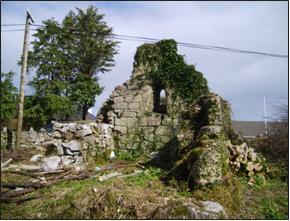 Still standing is the East Gable containing the unique and ancient round headed window under which would have stood the altar. Also remaining are parts of the north and south walls and it appears that the original entrance doorway would have been through the north wall. Sadly a part of the site boundary wall adjoining the newly created footpath alongside the main road has been partially knocked into the site during the footpath works. 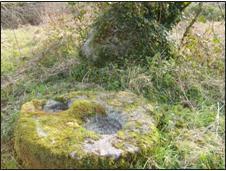 Nearby there is a very fine example of a double Bullaun Stone which would have been used for grinding out the corn by the monks. This is an Early Christian church dating back to ca 6/7th century and dedicated to St Brecan of whom little is known. There were apparently three St Brecans and this one may have been a Clare saint and possibly a patron of the royal dynasty of North Munster. 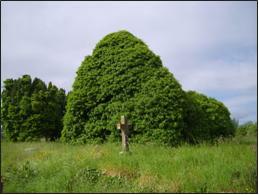 In nearby Oughterard cemetery there still stand the medieval ruins of the church dedicated to St Cummin which is now totally overcome and obliterated by ivy. Despite tentative efforts by this writer in the past to encourage the removal of this ivy it has now completely taken over and all the beautiful tracery work of the stone windows is being cracked and broken away. Sadly such damage is never likely to be repaired or replaced. Ivy should not be pulled away from such structures such as this but there is no harm in cutting both the growth and more importantly the roots as has successfully been done at the early Killannin church. The Kilcummin ruin stands probably on earlier ecclesiastical remains and definitely within an earlier monastic enclosure which can be detected around the edges of the higher ground.